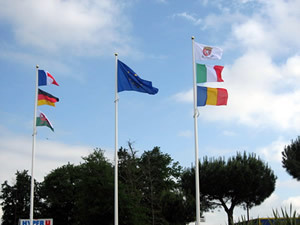 Clisson celebrates 30 years of twinning with Klettgau in Germany. 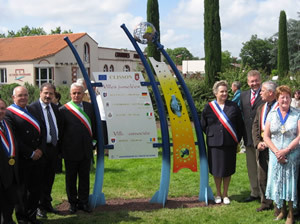 During the weekend of 19th May 2007, the town of Clisson celebrated the 30th anniversary of its twinning with Klettgau in Germany with a meeting of representatives of all its other associated towns. They are Cowbridge, Alatri (Italy) and Şisesti (Romania). Cowbridge Twinning was represented by the Chairman, Bob Wilson and his wife, Eleanor, and the Secretary, Andrew Lane and his wife, Ruth. The Mayor of Cowbridge was represented by Sue Cox accompanied by Jeff, her husband. The theme of the weekend was "Solidarity" and was explored in various meetings but the highlight was the unveiling of a sculpture beside the newly named "Rond-point de l'Europe". An evening of conviviality, which included a German "oom-pah" band and Breton folk dancing, was enjoyed by over four hundred and fifty people from the five towns. 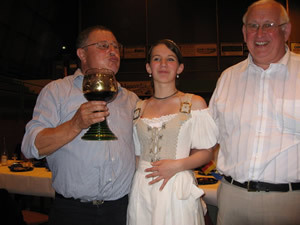 Here, Bob Wilson and Gilles Renoul enjoy the wine presented by the Klettgau Wine Princess.